Hiring a Bilingual transcription expert offers many benefits to the businesses. Above all the gains is the expansion of business beyond the national boundaries.Quality over quantity, expertise and punctuality are few of the many reasons why organizations outsource bilingual transcription services. The companies for transcriptions of many languages, like, French, Haitian, Japanese, Spanish to English or vice versa.The certified bilingual transcriptionists skilled in various native languages offer transcription services for Legal, Financial records, medical research documents, business meetings, conferences, educational, academic manual, marketing industry and many more. Files are sent to the transcription company whose services the company is going to avail. The bilingual transcription company then sends files to a storage location from where it can be accessed easily. The audio, video recordings are transcribed in accordance with the Summarize or Verbatim modes and the files are transcribed to the chosen language. The output is produced according to the requested format. And finally, the output is uploaded in the storage location that can be a server or mailbox so that it can be easily accessed. Experienced Staff: It is not an easy task to find an appropriate person for the transcription job as an inexperienced can ruins the job. Therefore, it is best to leave the task to a professional in this field. Fast Transcription: Transcription companies offer quick turnaround times. Some of them offer same or next day delivery. Cost-effective Services: The flexible rates of the bilingual transcription companies make them the number one choice. Accuracy & Confidentiality: Leaving no room for error these transcription companies guarantee security of the information shared. Flexible: With the rapid changing conditions, it gets difficult for the organizations whereas it’s a daily task of a professional transcription service company. High Productivity: Giving staff more time to focus on other key areas and functionalities of the organization. Pie Multilingual is one of the best choices among many other bilingual audio outsourcing companies The bilingual transcription of languages we provide is of very wide range, like, French, Chinese, German, Mandarin, Italian, Korean and many more that are being used on a global scale. 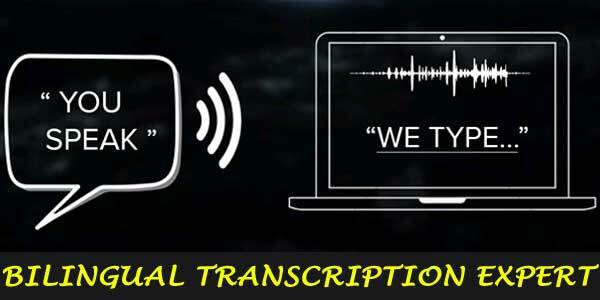 The highly skilled team of transcribers works head over heels in order to quickly and efficiently produce the most accurate transcriptions and translations. We assure that by outsourcing bilingual transcription services to us expect confidently, reliable and timely delivery from our expert team of transcription and translations offering services in cost-effective rates with all-time multilingual customer support.